Be water safe this summer! The highlight of any family holiday is having fun & relaxing at the swimming pool at your hotel or resort. Below is a checklist to help you get the most out of your next break and ensure you can enjoy it as safely possible and to make sure you’ve packed everything you need! 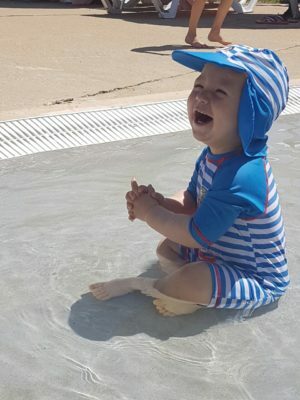 Does your hotel or holiday resort have baby-friendly swimming facilities? Is there a separate baby pool or baby area? Swimming pools can become very lively at peak times. Babies & toddlers could become freighted if older and rowdier kids are making lots of noise and jumping in and out. Get your little Aqua-baby kitted out with some cute little swimming gear! You should invest in a little baby wetsuit perfect for babies and little tots to enjoy the water for longer as most outdoor pools are unheated. Even in heated pools babies can get cold quite quickly, so the soft neoprene fabric that fits snugly around baby’s body creates a warm, loving hug. It’s easier for parents too as the fabric ensures you keep a firm grip on your baby. With both of you relaxed and happy, you can enjoy yourselves to the full. Keep baby protected (and other swimmers!) with swim nappies and nappy covers. 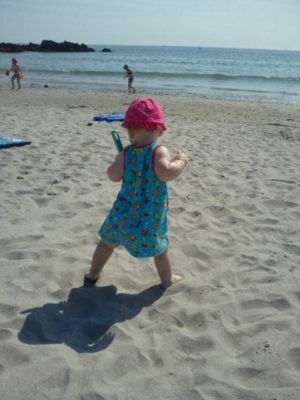 It’s also an idea to get protective swimwear for your little one if you are swimming in the sunshine. If you are abroad; the sun is generally a lot harsher than the Irish sun. Get some baby-friendly sunscreen for babies over six months (and yourself!). For babies younger than six months, look for full shade or better yet, indoor pools and remember to keep applying throughout the day, even if it looks overcast and if you in the water most of the day, that is when you and your little one can get the most burnt! Bring some familiar pool toys or bath toys, this will make swimming even more enjoyable for you and your little one, Swimming with baby & toddlers safely! NEVER EVER LEAVE ANY CHILD UNATTENDED IN THE WATER REGARDLESS OF HOW MANY LESSONS THEY HAVE HAD! Wait at least an hour after you have fed your little ones before going swimming. Only take your baby into the shallow end of the pool when you start and always test the temperature of the water yourself, outdoor pools are unheated so keep baby close and moving and if temperature under 30degrees only stay in a max of 10 to 15 mins. It is vital to keep your concentration and don’t rely on baby floats or armbands to keep your baby or toddlers safe. Be safety conscious on the poolside. Check where the rescue equipment and first aid kit are and if there are any lifeguards on duty. The moment your baby or toddler starts to look cold and shiver, take him or her out the water and wrap them in a warm towel. Remember to never take your baby swimming if they have been sick, always wait at least 2 days after they have recovered from a tummy bug, cold or infection. It’s not advisable to take a baby into the sea if they are under 12 months as their kidneys can’t cope with the salt water they may swallow. If you want to take a baby into the sea make sure you hold baby’s head up and out of the water! 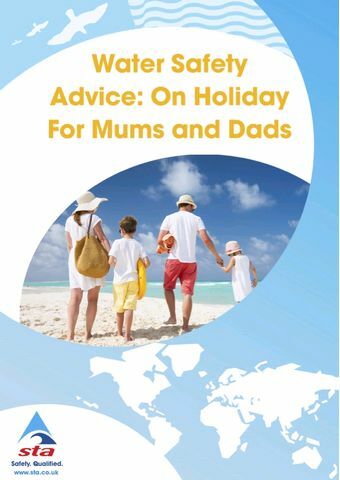 Below is great water safety holiday advice leaflet for parents and guardians from the STA, free to download.